I've been in the writing cave for a couple of solid months and my reading has suffered a bit. I'm borrowing a great idea from Ghenet Myrthil who has embarked on a 12/12/12 Reading Marathon to meet her Goodreads goal for the year. Any recommendations for quick, easy reads that pair well with MAJOR revising/rewriting? In other news, I am THRILLED to share that Dawn Klehr, critique partner extraordinaire, signed a two-book deal with Flux and her YA novel THE CUTTING ROOM FLOOR will be out in Fall 2013. Read all about it on Dawn's blog. Dawn's story is evidence that if you work hard enough, it will happen. I'm so proud of her. I bought myself a little reward for winning NaNo. In BEAUTIFUL BIRD, Elliot gives Addie a ring made from a 1948 Oneida sterling silver spoon in the Mansion House pattern. So... yeah, I pretty much had to have it. This past week I also decided to throw my CLOUD 9 hatchet into the Pitch Wars arena. Pitch Wars is an amazing contest run by Brenda Drake with the involvement of a ton of authors, editors, agents, etc. If you've got a polished manuscript that's ready for the real world, you've got until December 5th to submit your applications to the three mentors of your choice. What have you got to lose? Stay tuned for updates. Coming out of the writing cave - even briefly - has found me completely sucked back into twitter, so I'll be going back into the cave later today. Not writing makes me crabby. It's MNYA Writers critique week so I've got two manuscripts to read and critique. I'll be diving back into BIRD, getting back into my reading groove, and NOT looking at the #pitchwars twitter feed. And we'll be putting up the Christmas tree today. What's on your agenda for the week? That ring is beautiful! Good luck with your reading challenge in December. Lovely NaNo momento. Good luck with revising BIRD and #pitchwars. I'm rooting for you all the way. Good luck with your book blitz! 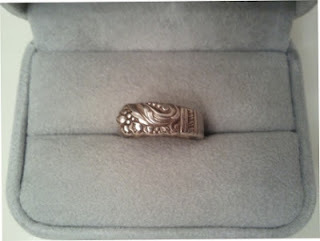 And I love the ring - my mom had a similar one when she was a teen that I used to wear as a teen. Thank you! I need to do a little more research into the history of these rings. I don't know that it matters for my story, but I'm curious! So excited you're joining the challenge! It's going to be fun! I have a suggestion for a book that could inspire your re-writing - SECOND SIGHT by Cheryl B. Klein. It's a writing craft book focused on revising YA and children's manuscripts, and I really enjoyed it! It's now one of my favorite writing craft books. Thanks, Ghenet - I'm super excited to get back into the swing of things for reading. That book rec is PERFECT! I'm going to look it up right now.